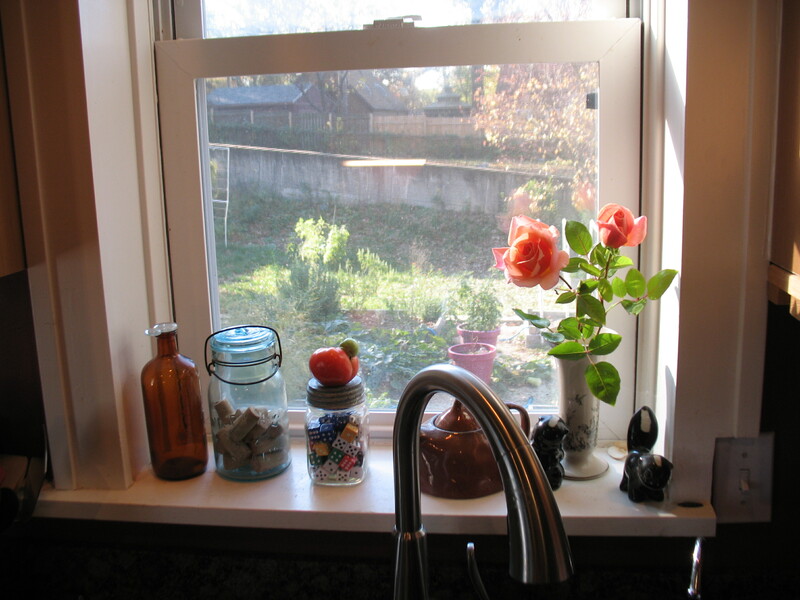 The kitchen window sill holds (from left to right): A bottle from my grandparents’ old barn (with a fused glass topper I pulled out of Mary K.’s flower arrangement because I liked it), an old jar with corks, a second old jar with dice, the teapot we use to brew herbal tea, and a vase from Goodwill with the last two roses of the season flanked by skunk figurines that Ernesto bought at the antique mall. Oh, and I can’t believe that I nearly forgot to identify Ernesto’s special tomato, from our late harvest. What’s on your window sill? Erin Rivers photographs places. She didn’t always. She used to be an artist in paint and ceramic, studying at Webster University and the Art Institute of Chicago. 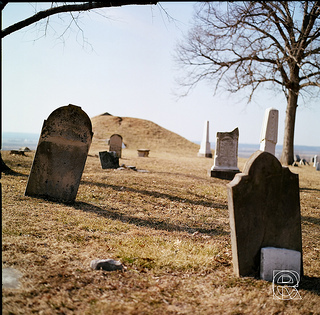 But in 2005 she inherited her father’s Hasselblad camera—and that camera took her in a new direction, on a route she likely would not have taken otherwise. 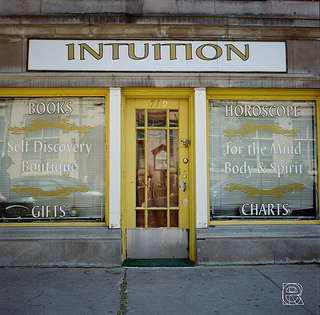 After learning to use the Hasselblad—which requires a far different set of actions and a vastly different timeframe than the simple point-and-shoot digital cameras and cell phones that we all use—Erin set out to retrace her father’s steps and visit some of the small towns and byways that he had once photographed. Along the way she discovered her own rough roads and special places. I made my way to the Burfordville Covered Bridge, but I was on the opposite side of Bollinger Mill. Crossing the bridge is an interesting experience; it is dark of course and you can smell the passage of time and many other unidentifiable things. Light passes through the splits and holes in the wood and creates an interesting pattern along the sides and the floor. 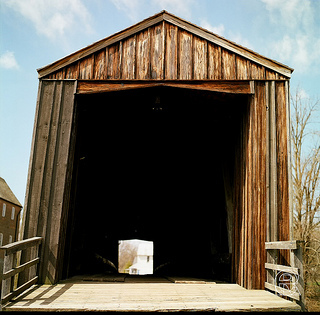 Known as a Howe Truss, the Burfordville Bridge is the oldest remaining covered bride in the state of Missouri. The architecture of the mill itself caught my eye, the stone base combined with the brickwork and several windows located on the upper floors. I was able to peek through the windows and see a little bit of the machinery that is on display, but nothing that I could really identify. After a few more photos of the mill, an old bus and a caravan of cars squealed into the parking lot, honking their horns. I learned later that this was a Baptist church group getting ready for the day’s Easter egg hunt. I never would have guessed this based on their entrance. 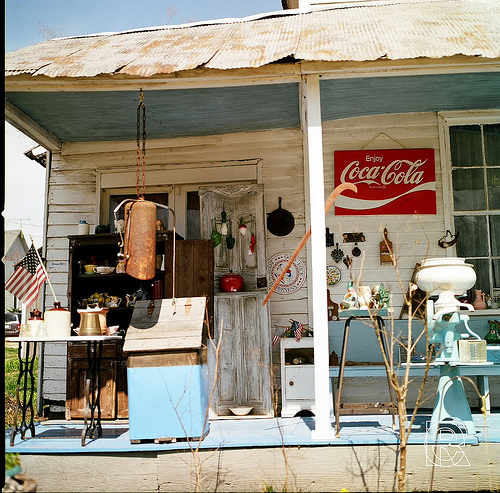 Erin’s photographs help us get to know some of the small towns and hidden places scattered through Indiana, Illinois, and Missouri—Fairmount, Burfordville, Atlanta, Greentown. Nearly deserted, they often look like temporary backdrops that could be dismantled in a few hours and trucked away. But you never know what may be about to happen, just outside the frame. There could very well be a passel of Baptists about to tear it up at an Easter egg hunt. I think that the best part of picking up processed film and finding out what you have created is the moment just before you open the envelope. Quotations were pulled from Erin’s travel log, and are reprinted here with her kind permission. To view more of her wonderful photographs, visit http://www.flickr.com/photos/erinrivers.